What does this timeline represent? In this timeline I show how the interest rates for the long term bonds change over time for the Countries of the Eurozone. This is the interest rate countries pay to refinance their debts. Why is this interesting? This interest rate is a very good indication of the financial stability of a country. Is the rate high, then refinancing debt will cost more and more and interest payments will go up. A situation which, at certain percentages, will bankrupt a country. Timeline at the bottom shows events that occur during the period 2009 to 2012. For each event a 'bubble' is shown that explains a bit more about the event. The map shows the countries. Green means low debt rate, red means high debt rate. For better visualization the height of a country is also defined by this debt rate. 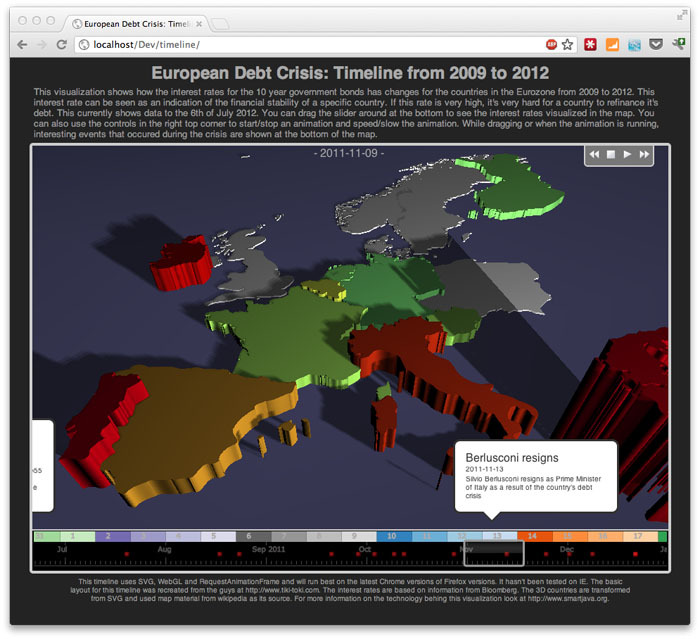 d3.js: This library is used to create the timeline visualization at the bottom. In a couple of future articles I'll go into more detail on how the various libraries are used.